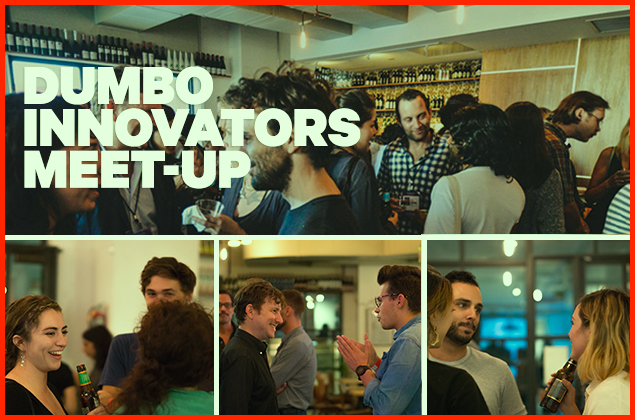 The DUMBO Innovators Meet-Up is a monthly series highlighting innovative companies in DUMBO, Brooklyn. At this lively mixer event, meet your neighbors and experience the vibrancy this community has to offer first-hand. Free beer will be provided courtesy of Sixpoint Brewery. DUMBO has long been home to individuals and companies with equal parts creativity and business acumen. Each month, we’ll be shining a spotlight on the vanguard, cutting edge companies and people who call DUMBO their home. During a brief moderated discussion, industry leaders in storytelling, media, and tech will share their philosophy around innovation: what it means for their company, and how to approach innovation in business as well as in life. 6:30 PM – 7:00 PM: Networking / Free Beer + Tacos! 7:30 PM – 8:30 PM: Networking / Free Beer + Tacos! Juniper Jones: "Juniper Jones is equal parts agency, production studio, and technology lab. We specialize in visual storytelling and technology driven experiences while shortening the distance between an idea and its execution. Recently, we crafted Augmented Reality experiences for Dell, Content Pieces for TED Talks, and 360 Branding for a major film festival." Kevin Robinson is an award winning Creative Director, Innovative Thinker, and the Founder and Executive Creative Director of Juniper Jones. His passion is to solve problems through creativity, innovation, and clear communication. Thursday, December 13 – Special Edition: Holiday Bash 2018! The DUMBO Improvement District is a 501(c)(3) non-profit organization dedicated to enhancing and promoting DUMBO, Brooklyn. The Improvement District showcases DUMBO as a world-class destination, advocating on behalf of DUMBO's businesses, property owners and residents. The organization provides supplemental sanitation services, marketing, economic development, neighborhood programming and long-term planning.